Family-centered books are a dime a dozen amongst today’s publishers. Author Clint Archer sets this paradigm on its head with The Home Team. Writing for those who “believe in Jesus as our only Lord and Savior” (9) without being “intended as a rulebook or a checklist” (11), Archer presents a strong front for a salvation and grace oriented family. Though occasionally treading too closely to the legalistic side (e.g. technology, 20-25), the general tone of The Home Team is focused on the family unit living for Christ unto the glory of God (33-36). The Home Team starts with a beneficial reading of the fall of man (chapter 1). Highlighting the necessity for God-centered fulfillment, Archer walks through marriage, work, and relationships and how the curse upon each points fallen human beings back to fulfillment in Christ (15-19). With this general truth understood, The Home Team addresses fathers (chapter 3), mothers (chapter 4) and children (chapters 5 & 6) in rapid succession. The challenges to each group are in fact quite profound. A father must understand “he is still the head” even when he doesn’t act as such and “God holds him responsible for the team” (42). This includes treating his wife with “intimate study and care” (43), focusing on contentment (43-45), and becoming “what God wants them to be, not just do what they need to do” (52). When addressing wives and mothers (chapter 4), Archer avoids an overly allegorized understanding of Proverbs 31 (60-61), often used to bring a sense of “reality check” to expectations for Christian wives, with a sincere attempt to ensure the godly upbringing of the home. The Home Team does not condemn working outside the home (62-64) but stresses for both men and women the need to cultivate the home first. Archer does stumble at times expositing in which ways Sarah remains a godly example in 1 Peter 3 (65-68) but the general tone of the chapter is accommodating (including a stern rejection that women should ever submit to any form of abuse, 70). When contemplating the role of children in the “family team,” Archer correctly notes they must be trained “to participate in family life now” while being prepared” (72). Far from what society, even Christian society, false assume, “obedient children are not a result of winning the genetic lottery; rather, children are commanded to obey because it is not in their nature” (74). The Home Team does not pull its punches in this department as it stresses strict parental involvement without hovering. Archer’s commendations against the usual pitfalls of this generation’s teenagers are a valuable read (88-99). It is at this point that the general theme and understanding of The Home Team becomes clear. After some of the easier subjects, Archers includes a rather obtuse chapter on singleness (chapter 7). Despite being an excellent chapter, the entire tone comes off as a soapbox platform (admittedly one that this reviewer agrees with entirely). Also, it is this chapter that first mentions God’s “covenant community” (103). Though this may slide past readers of a baptistic background, this is a stark and telling paradigm for all of Archer’s writing. It simply is not covenantal. This reveals itself again in the chapter dealing with “Team Supporters” (chapter 8). The entire discussion concerning schooling is only sensible from a non-covenantal view (116-120). One is falsely lead to believe any school education is viable since it is never religious (116-117) and if it does become religious the previously “unqualified” parents are required to thoroughly and faithfully critique the teaching material (118). In this regard, The Home Team is naïve and defeatist while potentially influencing God-fearing families in an incredibly wrong direction. 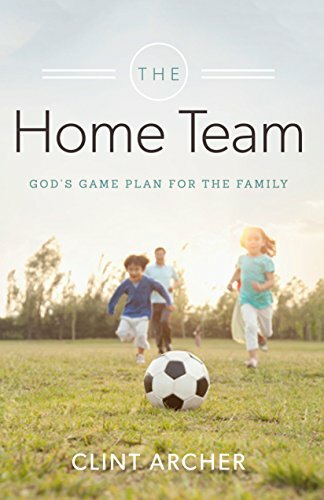 In conclusion, The Home Team closes strongly, reminding families that the goal of parenting is “to raise children who are independently dependent on Christ” (133). The wisdom of Clint Archer is sufficiently positioned towards the Scriptures and Christ to be of benefit to the church. Although covenant orientated families, and churches, will be appreciative of Archer’s insight, they will ultimately be unsatisfied.